The Craven County Community Foundation holds one of the most dynamic endowments in the state – the Richard Chapman Cleve Fund. Established through the generous bequest of Richard Chapman (R.C.) Cleve, the fund is building a lasting legacy of good works in the community. The fund memorializes Cleve as a local businessman and pillar of the community by providing financial support that benefits charitable purposes in Craven County. Since 2007, the Cleve Fund has had a transformative impact on Craven County and the surrounding communities. The fund has granted almost $500,000 since 2010, benefitting an array of nonprofit organizations that meet important areas of need in Craven County. 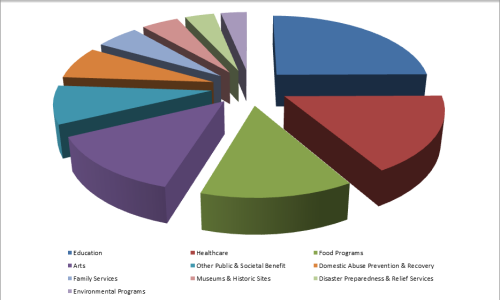 As seen above, the Fund is impacting an array of the categories of need in Craven County. The grants awarded since 2010 include $121,675 for education, $81,620 for healthcare, $64,190 for food programs and much more. The awarded grants have a deep impact across Craven County, including Cleve’s rural hometown of Vanceboro. That legacy of impact specifically benefitting Craven County was Cleve’s ultimate intent. He lived almost his entire life in the Vanceboro area, participating in the operation of family businesses after returning from a modeling stint in New York. The depth of the fund’s impact is seen in the stories the grantees awarded have to tell. One such example is the Coastal Women’s Shelter, which addresses domestic abuse prevention and recovery in the community. The shelter reports that without this type of financial support, some women may feel they cannot make it on their own and often return to their abusers. The Coastal Women’s Shelter is just one example in the massive pool of organizations benefited. The sheer diversity in grants awarded is a reflection of the community Cleve called home as he operated the family furniture store, soda shop, grocery store and several farms. Cleve was known for taking the time to talk with the students from Vanceboro Farm Life School when they stopped for orangeades at the soda shop. The school is now the beneficiary of multiple generous grants. Although Cleve himself never attended college and completed only the eleventh grade, he continued his education in many other ways. He was an avid fan of the stock market and a dedicated reader of the Wall Street Journal. He became a very prudent investor and built a small personal fortune unknown to most members of the community. That fortune is now endowed to benefit the local community forever. NCCF Regional Associate and Craven County resident Kim Ball has seen firsthand the profound breadth and depth of the fund’s footprint in the county. “This fund has had a uniquely transformative impact upon our community,” she said.